These scrumptious chicken wings are going to melt on your taste buds making you crave for more and more. I've used a generous amount of honey which can be moderated to get a spicier version. There are different ways to cook these chicken wings, viz., pan frying, grilling, and baking. I'll use the first method because it is much simpler and gives equally good results. If you're looking for a fiery version of this recipe, substitute white pepper powder with freshly ground black pepper and that too, a bit more. If chicken wings are not available, you can use chicken legs too. 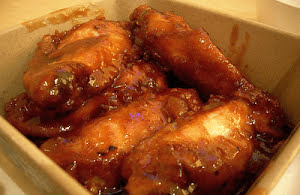 One can also sprinkle some chili flakes on top of these wings, right before serving. Let's quickly prepare these delicious chicken wings. Savor these mouthwatering and fulfilling chicken wings covered with honey and white pepper which gives it a unique aroma and flavor to satisfy your hunger. Season chicken wings with lime juice and kosher salt. On a high setting, microwave all the wings for about 5 minutes. Keep aside. In a bowl, add honey, white pepper powder, dark soy sauce, oyster sauce, garlic powder, onion powder, sesame oil, cornflour, and peanut oil. Briskly whip all the sauce ingredients for a minute. Put a large nonstick pan on a medium flame. Transfer all the whipped sauce mixture to the pan. Gently stir the sauce continuously till (approx. 5 to 6 minutes) it thickens. Switch the flame to low and transfer all the microwaved chicken wings to the pan. Gently toss and coat the thickened sauce on the wings with a spatula. Simmer for about 4 to 5 minutes gently tossing the wings for about 2 to 3 times.